The Santa Monica Mountains is a coastal mountain range in Southern California, paralleling the Pacific Ocean. It is part of the Transverse Ranges. Because of its proximity to densely populated regions, it is one of the most visited natural areas in California. Santa Monica Mountains National Recreation Area is located in this mountain range. The range extends approximately 40 miles (64 km) east-west from the Hollywood Hills in Los Angeles to Point Mugu in Ventura County. The western mountains, separating the Conejo Valley from Malibu, suddenly end at Mugu Peak as the rugged, nearly impassible shoreline gives way to tidal lagoons and coastal sand dunes of the alluvial Oxnard Plain. The mountain range contributed to the isolation of this vast coastal plain before regular transportation routes reached western Ventura County. The eastern mountains form a barrier between the San Fernando Valley and the Los Angeles Basin, separating "the Valley" on the north and west-central Los Angeles on the south. The Santa Monica Mountains are parallel to Santa Susana Mountains, which are located directly north of the mountains across the San Fernando Valley. The range is of moderate height, with no particularly craggy or prominent peaks outside the Sandstone Peak and Boney Mountains area. While often rugged and wild, the range hosts a substantial amount of human activity and development. Houses, roads, businesses, and recreational centers are dotted throughout the Santa Monica Mountains. A number of creeks in the Santa Monica Mountains are part of the Los Angeles River watershed. Beginning at the western end of the San Fernando Valley the river runs to the north of the mountains. After passing between the range and the Verdugo Mountains it flows south around Elysian Park defining the easternmost extent of the mountains. The Santa Monica Mountains have more than 1,000 archeology sites of significance, primarily from the Californian Native American cultures of the Tongva and Chumash people. The mountains were part of their regional homelands for over eight thousand years before the arrival of the Spanish. The Spanish mission system had a dramatic impact on their culture and by 1831, their population had dropped from over 22,000 to under 3,000. Geologists consider the northern Channel Islands to be a westward extension of the Santa Monicas into the Pacific Ocean. The range was created by repeated episodes of uplifting and submergence by the Raymond Fault that created complex layers of sedimentary rock. 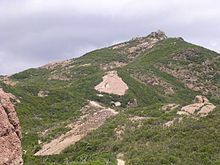 Volcanic intrusions have been exposed, including the poorly named, andesitic, "Sandstone Peak" the highest in the range at 3,111 feet (948 m). Malibu Creek, which eroded its own channel while the mountains were slowly uplifted, bisects the mountain range. The Santa Monica Mountains have dry summers with frequent coastal fog on the ocean (south) side of the range and wet, cooler winters. In the summer, the climate is quite dry (except for coastal fog), which makes the range prone to wildfires, especially during dry "Santa Ana" wind events. Snow is unusual in the Santa Monica Mountains, since they are not as high as the nearby San Gabriel Mountains. The highest slopes of the central and western Santa Monica Mountains average as much as 27 inches of rain per year, but 18-22 inches is more typical of the range. The bulk of the rain falls between November and March. Rainfall is generally higher in the central and western parts of the range. This is reflected in the vegetation. The central and western portions of the range generally support more widespread woodlands (with oak, sycamore, walnut, bay laurel, alder and other trees) than the eastern part of the range, where trees are usually restricted to the stream courses. 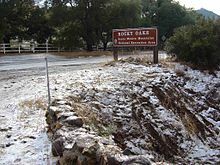 On January 17, 2007, an unusually cold storm brought snow in the Santa Monica Mountains. The hills above Malibu picked up three inches (eight centimeters) of snow - the first measurable snow in five decades (50 years). Snow was reported on Boney Peak, in the winter of 2005; and in March 2006, snow also fell on the summit of the mountain. Snow also fell on the peak of Boney Mountain in late December 2008. The latest recorded snowfall in the area was in February of 2019 where an unusual amount of snowfall accumulated in low passes in the mountains. The storm system also brought rare snowfall to the Los Angeles area. Much of the mountains are located within the Santa Monica Mountains National Recreation Area. Preservation of lands within the region are managed by the Santa Monica Mountains Conservancy, the National Park Service, the California State Parks, and County and Municipal agencies. Today, the Santa Monica Mountains face pressure from local populations as a desirable residential area, and in the parks as a recreational retreat and wild place that's increasingly rare in urban Los Angeles. In 2014 the California Coastal Commission and the Los Angeles County Board of Supervisors approved the Santa Monica Mountains Local Coastal Program, a land-use plan that will distinguish between the private lands that need strict protection and property that could be developed in strict conformance with this detailed plan. Over twenty individual state and municipal parks are in the Santa Monica Mountains, including: Topanga State Park, Leo Carrillo State Park, Malibu Creek State Park, Point Mugu State Park, Will Rogers State Historic Park, Point Dume State Beach, Griffith Park, Marvin Braude Mulholland Gateway Park, Charmlee Wilderness Park, Franklin Canyon Park, Runyon Canyon Park, King Gillette Ranch Park, and Paramount Ranch Park. At the eastern end of the Santa Monica Mountains are Griffith Park and lastly Elysian Park. Griffith Park is separated from the rest of the Santa Monica Mountains to the west by the Cahuenga Pass, over which the 101 Freeway (also called the Hollywood Freeway) passes from the San Fernando Valley into Hollywood. Elysian Park is in the easternmost part of the mountains and is bordered by the Los Angeles River to the east and Downtown Los Angeles nearby to the south. The range is host to an immense variety of wildlife, from mountain lions to the endangered Southern California Distinct Population Segment of steelhead. The mountain lion population is challenged because the Santa Monica Mountains are too isolated and not big enough for weaned cubs to find their own territory. The primary cause of the decline is due to a combination of traffic related mortality (3 from the area were killed within a matter of months,) anti-coagulants ingested from human poisoned prey (2 individuals within the Simi Hills) and attacks by other, more dominant mountain lions (an elder male, known as P1, killed both his son and his mate; this is thought to be due to a reduction in available habitat.) Snakes are common but only occasionally seen: the Southern Pacific rattlesnake (the only venomous species), mountain kingsnake, California kingsnake, gopher snake, and garter snake. The mountains are also home to the western fence lizard and the Coastal Whiptail. The Santa Monica Mountains are in the California chaparral and woodlands ecoregion, and includes the California oak woodland and southern coastal sage scrub plant community, and are covered by hundreds of local plant species, some of which are very rare or endemic, and others which are widespread and have become popular horticultural ornamentals. Dudleya verityi is a rare species of succulent plant known by the common name Verity's liveforever. Endemic to Ventura County, this species is only found on one edge of the Santa Monica Mountains, where it occurs in coastal sage scrub habitat. The most common trees in the mountains are oak and sycamore. The California black walnut, endemic to California, grows on the northern side of the mountains in the Valley and Griffith Park. Other species include willow and alder (along stream courses) and bay laurel. Several species of ferns (including large sword ferns) are found in wetter, shady areas throughout the range, especially near streams. Many invasive weeds have colonized the mountain habitats, such as annual Mediterranean grasses, Spanish broom (Genista juncea), and yellow starthistle (Centaurea solstitialis). In creekside riparian habitats are found plants such as giant cane (Arundo donax), German ivy (Delairea odorata), blue periwinkle (Vinca major), and ivy (Hedera spp.). The New Zealand mud snail has infested watersheds in the Santa Monica Mountains, posing serious threats to native species and complicating efforts to improve stream-water quality for the endangered steelhead. Within a period of four years, the snails expanded from their first known population in Medea Creek in Agoura Hills to nearly 30 other stream sites. Researchers at the Santa Monica Bay Restoration Commission believe that the snails' expansion may have been expedited after the mollusks traveled from stream to stream on the gear of contractors and volunteers. Cahuenga Pass, present-day site of U.S. Route 101, is the easiest pass through the range connecting the Los Angeles Basin to the San Fernando Valley. In the 1800s, two battles were fought there, and the Treaty of Cahuenga was signed nearby. In the heyday of Hollywood, movie studios clustered on both sides of it. Sepulveda Pass is the main north-south pass to the west, connecting the Westside to Sherman Oaks via the San Diego Freeway (I-405) and Sepulveda Boulevard. Minor passes between the Sepulveda and Cahuenga passes include Laurel Canyon Boulevard, Coldwater Canyon Avenue, and Beverly Glen Boulevard. Further west of the Sepulveda Pass are Topanga Canyon Boulevard (SR 27), Malibu Canyon Road and Kanan Dume Road. Mulholland Drive runs much of the length of the Santa Monica Mountains, from Cahuenga Pass to Woodland Hills, although it is not open to motor vehicles west of Encino. The Mulholland Highway runs from Woodland Hills to Sequit Point at the Pacific Ocean. The eastern end of the range, located in the City of Los Angeles, is more intensively developed than the western end of the range. The city of Malibu runs between the coast and the leading mountain ridge, from Topanga Canyon in the east to Leo Carrillo State Park in the west. The Rim of the Valley Trail is a plan in progress for accessing and connecting the parkland and recreational areas of the mountains surrounding the Conejo, San Fernando, Simi, and Crescenta Valleys. 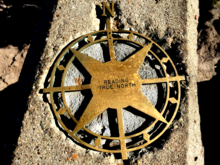 With trailheads in the mountains and valleys, it would link them via existing and new: walking, hiking, equestrian, and mountain biking trails; parklands; and conservation easements. The Rim of the Valley project also has the goal to protect flora-fauna habitats and wildlife corridors between the Santa Monica Mountains and the inland ranges. ^ "Santa Monica Mountains". Geographic Names Information System. United States Geological Survey. Retrieved May 3, 2009. ^ a b "Mugu Peak". Geographic Names Information System. United States Geological Survey. Retrieved May 3, 2009. ^ Volcanoes - Santa Monica Mountains National Recreation Area. Nps.gov. Retrieved on September 18, 2013. ^ Carlson, Cheri (April 24, 2015). "Young male mountain lion follows sister out of Santa Monica Mountains". Ventura County Star. ^ Roderick, Kevin (May 5, 2015). "Secrets of the LA mountain lions". LA Observed. ^ "Behind the scenes with a Los Angeles mountain lion expert". Phys.org. UCLA. May 5, 2015. ^ Carlson,, Cheri (September 29, 2013). 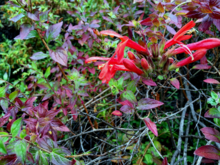 "Scientists keep eye on rare plant burned in Springs Fire]". Ventura County Star. Archived from the original on August 9, 2014. 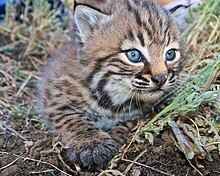 ^ "Exotic Animals - Santa Monica Mountains National Recreation Area (U.S. National Park Service)". www.nps.gov. Retrieved July 21, 2018. ^ "Sandstone Peak". Geographic Names Information System. United States Geological Survey. Retrieved May 3, 2009. ^ "Boney Mountain". Geographic Names Information System. United States Geological Survey. Retrieved May 3, 2009. ^ "Castro Peak". Geographic Names Information System. United States Geological Survey. Retrieved May 3, 2009. ^ "Saddle Peak". Geographic Names Information System. United States Geological Survey. Retrieved May 3, 2009. ^ "Calabasas Peak". Geographic Names Information System. United States Geological Survey. Retrieved May 3, 2009. ^ "San Vicente Mountain". Geographic Names Information System. United States Geological Survey. Retrieved May 3, 2009. ^ "Clarks Peak". Geographic Names Information System. United States Geological Survey. Retrieved May 3, 2009. ^ "Mesa Peak". Geographic Names Information System. United States Geological Survey. Retrieved May 3, 2009. ^ "Cahuenga Peak". Geographic Names Information System. United States Geological Survey. Retrieved May 3, 2009. ^ "Brents Mountain". Geographic Names Information System. United States Geological Survey. Retrieved May 3, 2009. ^ "Mount Lee". Geographic Names Information System. United States Geological Survey. Retrieved May 3, 2009. ^ "Mount Hollywood". Geographic Names Information System. United States Geological Survey. Retrieved May 3, 2009. ^ "La Jolla Peak". Geographic Names Information System. United States Geological Survey. Retrieved May 3, 2009. ^ "Laguna Peak". Geographic Names Information System. United States Geological Survey. Retrieved May 3, 2009. Outdoor LA Hiking Trails Trails and trailheads with maps and directions. Ventura County Trails in SMMNRA Maps and trails descriptions.